Today we continue our learning journey to another Pictograph Chinese character - 鱼, whose traditional version is 魚. It is kind of hard to guess the meaning with its current form: 鱼 | 魚. However once you see its Oracle script and Bronze script, you will definitely know what it means. Here it is: Oracle script of 鱼 is , and its Bronze script is . Is not it actually a stick figure of fish, as shown below? We can see that its Seal script is still containing the most characteristics of 鱼. Then it is deformed into during Clerical script era, which became pretty much the same as what we write today as Traditional character: 魚. So 鱼 originally means freshwater fish that is commonly seen in China. for example: 鲫鱼. 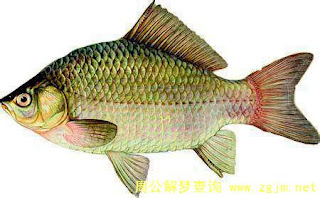 Then it is eventually used to mean most species who lives in water and has the shape of a fish, too. For example: 鲸鱼.